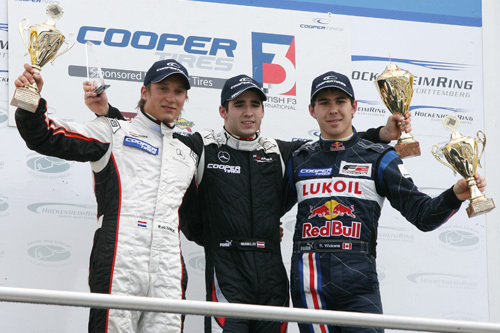 BRDC Rising Star Robert Wickens was in podium performing form yesterday as he made a guest appearance in the British Formula 3 International Series at Hockenheim. Robert, who is racing in Formula 2 this season, finished third in the second race of the weekend. In race one, Robert failed to finish, but BRDC Rising Star Daniel Ricciardo was near the top of the results sheets in fourth, just one place ahead of fellow Rising Star Max Chilton. With Nick Tandy disqualified from the results, BRDC Superstar Wayne Boyd was promoted to eighth, while Rising Star Hywell Lloyd was ninth. BRDC Rising Star Jay Bridger was 11th with the last of the BRDC finishers being Rising Star Henry Arundel in 13th. BRDC Superstar Riki Christodoulou was another non finisher, having become involved in a first lap pile-up. In race two, with Robert on the podium, Riki Christodoulou was the next highest BRDC finisher in fifth place. Daniel Ricciardo finished race two in eighth place just ahead of Henry Arundel while Max Chilton was 16th. Wayne Boyd, Hywel Lloyd and Jay Bridger all failed to finish the second race.